The backing reflects the growing muscle of progressives. In his quest to beat three millionaires and a billionaire in the Democratic primary for Florida's governor, Andrew Gillum now has two billionaires behind him. Late Thursday, Tom Steyer's NextGen America announced that it's endorsing Gillum and plunging $1 million into his campaign, including a $500,000 donation from Steyer to Gillum's political committee, Forward Florida. The political organization called the money an "initial investment," and said it's also provided 50 organizers as part of an effort to help Gillum with his field, digital and mail operations, specifically those targeting voters under the age of 40. 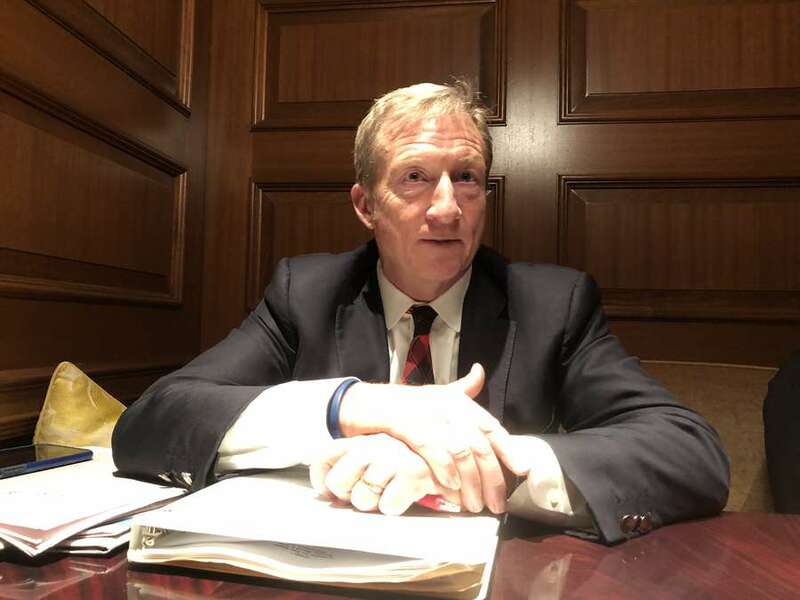 "As we battle for the heart and soul of this nation, Andrew Gillum is the kind of leader we need on the front lines," Steyer said in a statement. "He's someone we can trust to do the right thing, to put the people before the powerful, and who is unafraid to stand up for justice, now when we need it most. Those who are willing to act courageously and stand up for what is right, are those who will shape the political landscape of the country, and that's why we're taking this unprecedented step to make sure Andrew is representing the Democratic Party in November." NextGen's relationship with Gillum, the mayor of Tallahassee, goes back to Gillum's time as executive director of the Young Elected Officials Network. The endorsement of Gillum is a continuation of a NextGen political effort in Florida this election cycle that began in March when the organization announced it was spending $3.5 million to register and engage young voters. Gillum already had the endorsement of George Soros, a billionaire Democratic donor, who along with Steyer got a shout-out Thursday during a Fox News gubernatorial debate when Florida Agricultural Commissioner Adam Putnam said the two men are trying to hijack Florida politics. They are, at the very least, hoping to push Gillum ahead in the polls and help him make up a financial disadvantage against his four Democratic opponents, Gwen Graham, Jeff Greene, Chris King and Philip Levine.